As of today, my summer teaching marathon is over. Hurray! I love teaching, but I also really missed my summer this year. Everyone here in Manitoba had their vacation time but me! The kicker is that I seem to acquire raw goods (wool, vegetables, fruit) in direct correlation to the lack of time I have to process it. That is, the more stress I'm under, the more raw wool and food seems to appear in my house. Some people might call this retail therapy. I'm more inclined to think that without a steady production stemming from my hands, I feel like I'm not accomplishing much..even while teaching grad students four days a week. So, I somehow acquire more...and more...and then there's more stress to find time that I don't really have...to cope with it all. I realized that in order to stop myself from missing summer entirely, the Professor and I had to go outside and enjoy ourselves a bit. Over the weekend, we dodged rain clouds and went picking vegetables at grenkow's u-pick. This is the second year in a row where I've forgotten a camera, so you'll have to believe me. Roughly 8 miles out of town, there's a lot of prairie. A field with dark charcoal colored earth that stretches on and on with a layout like a big veggie garden. We picked tomatoes, eggplants, peppers, beans, some cucumbers, a dill stalk or two and 3 pie pumpkins. All in all, we paid around $78 and picked for less than 2 hours. The produce was something in the range of $1 or $2 a pound. I'd venture a guess that we picked over 50 lbs of produce. That's a whole lot of eggplant. That's a passel of peppers. That's (more than a) bag of beans...our refrigerator is full. You get the point! I've de-skinned and roasted tomatoes and garlic in the oven, pureed, them, and popped all that sauce in the freezer. The Professor and I cooperated on the eggplant. I chopped them in quarters, he roasted them on the gas grill outside. I chopped them up further and got them into freezer containers. Covered them with a bit of olive oil and popped them in the freezer. I sat down, plugged myself into an audio book and dealt with an enormous amount of beans, my hands moving methodically while I listened. I sauteed some of the red and green bell peppers with garlic, coriander, vinegar, salt and great amounts of olive oil. This makes a kind of Morrocan chermoula (chermoula is a certain combination of spices, I think, the recipes vary). I put it in bottles and then put it too in the freezer. One bottle at a time, this ends up in the refrigerator, and then on sandwiches, in pasta dishes, and other treats all winter. The flavored oil is delicious for salads. The floppy marinated peppers themselves, with some cheese, make a great melty sandwich. The oil also goes very well on homemade bread. This is a photo of some bread that came out of the oven at the height of the guest visits this summer. (That would be the Joanne's bed and breakfast crash course experience of 2010?!) I snapped a photo before everyone ate it. The next week or two I will be transitioning back into something that looks a bit more like my regular working life. I've got some editing and some writing deadlines to meet. I've also got a date with my canner. Putting up the harvest is next on my list. It's great to help people learn and grow in the classroom. It's rewarding and satisfying and exhausting all at once. That said, what the students gain can be intangible at times. A full freezer and a shelf full of jars? That's definitely an accomplishment that can tangibly set us up for winter...and it's a task with a beginning, middle and end. Along with all this, my loom and knitting needles await. I hope to have time for more than an exhausted and mindless few rows of a sweater sleeve at the end of the day, too. As soon as the rain lets up a bit, I'm off to mailbox to mail off my grades to the university. Then it's back to reducing (with great glee) the great mounds of food and fiber I've acquired. So, are you putting anything up for winter? Do tell! Descriptions are always welcome here--if comments give readers good ideas, our pantries (and families) will enjoy it together. The Craft on the Loose exhibit is over now, but before it ended, I shot photos. Here is a photo of the river...with bright knitted things right out in front. The plaza was full of people and I caught this spot at an empty moment. You might remember that red pylon? It looks like this in the winter time. I found my rug, hiding in plain sight. I was surprised by how well it hid on this concrete pylon. This summer, I realized that when I need to get a lot done, I find an intense focus. I organize the heck out of things, I keep my head down, and I just keep plowing through. I knew that I'd had it in the past, but I'd sort of lost sight of it. I think it was hiding inside of me--in plain sight. The Professor and I happen to choose old houses in neighborhoods that can be "on the edge." This was the case for us in 3 different neighborhoods. Our families encouraged us to look for something a little less transitional when we moved to Winnipeg. We did...I'm sure you've seen the photos of the tall elms in our neighborhood on the blog? This year, we saw that the builders were thinking about tearing the house down. We waited to see what would happen. Yesterday, I was grading papers at home. Meanwhile, directly across the street, right out my office window, this was happening. The wind blew towards our house, so I had to shut the windows. There was some dust. I kept grading. When next I looked up, it looked something like this. Oh. Right. No house. Huh, I thought. When did that happen? Well, when I did look up and think about it, I realized that the noise that bothered me all afternoon was a jackhammering sound. It was road construction in the opposite direction. The demolition happened --rather quietly--right in front of me, with a minimum of fuss. Funny thing how that happened. I found a whole new vista right in front of me, when I least expected it. I think maybe that intense focus allows creative people a chance to look up at the ordinary...and maybe see something entirely new. At least, I hope that's what is going to happen to me in a week or two, when the teaching ends and I get to go back to creating again. One of my lovely blog commenters said something like "Gosh I'd be nervous if I were interviewed on TV/radio, etc.!" You know, I'd be nervous too if I'd known it was going to happen... In Neepawa, it all just happened to me in the 15 minutes before and after the class I taught. I didn't have a chance to get nervous. Then I actually had an opportunity to get nervous this week--and I forgot! Several months ago, I sent an informal email (about knitting, of course) to someone at a radio station in Virginia. The announcer contacted me once or twice, and we set up a time to talk. I even put it on my office calendar. Today I was grading engineering graduate student papers--at 20 minutes or more for an academic level paper, it takes a while-- and the phone rang. There was that radio announcer. He said we'd go live in 2 minutes. "Huh," I thought and looked at the calendar. Oh. Right. If you want to hear what I sound like on the radio, here's the link. It wasn't a long interview, thank goodness. I'll be curious to hear what you thought of it. Cause, you know, if I'd remembered that I was going to be on the radio? I might have gotten nervous. About those guests...my wonderful Professor and I just looked at the most recent water bill. It covered the months of May, June and July. "Gosh," he says, looking worried and surprised. "Our water usage has gone up!" There was a long pause then. "Do you think, " I ventured, "It might be those 11 guests we had between May and mid-August?" I don't know how other people feel, but I find that the intense, short, and wonderful experiences I have at a fiber festival --any fiber festival--remain with me for several days or weeks after the event. In fact, it reminds me a lot of summer camp. At summer camp, everything is intense, short and sometimes bittersweet, too. I mean, it was cold and wet last weekend. I didn't actually feel tiptop and I was sort of worried to leave 2 different sets of house guests to fend for themselves. However, that didn't stop me from having a great time at the spinning circle after I taught my class. On the left here is a candid shot of a bunch of us spinning. At any one time, there were 3 or 4 of us, and we created a "floor" in the dirt of the barn with an old sheet. I met some readers of my blog, some fascinated onlookers, and some shepherds who came by just to visit. The ladies nearby at the n ext table were selling pie. How could I have had better neighborly company than that? While this was happening, my professor shot photos of possibly the cutest border collie puppy ever (see that photo?) and he spent time watching the show ring. He also met an entertaining kid who showed him all his digital photos and discussed bugs with him...never a dull moment for a biologist! The 4H sheep show part of this event was well organized. I was surprised to see how they numbered the sheep (on their rear ends) and that was definitely different than the arrangements I'd seen at the U.S. festivals. I made connections with people I'd met on Ravelry or emailed with, and I admired some of the (few) fleeces that were entered into the wool competition. Sheep producers gave me their contact information. This week, since coming home, I've contacted 3 different Manitoba sheep producers. I'm expecting (at minimum...), 2 Cotswold fleeces, perhaps a Romney fleec e, some Texel cross wool and maybe an Icelandic fleece or two to show up at my house sometime in the next month or so. Many of these farmers come to Winnipeg to do big city errands. My house will now be on their circuit! The Professor joked that this fleece delivery system sounded a lot like pizza delivery, only it would hang around a lot longer. With the rate I've gone through wool roving for my weaving, I'm not so sure. :) Plus, we do need more insulation for winter, right? Lately, it's occurred to me that teaching this graduate level writing class at the university 4 days a week is also a lot like camp. While my earlier class seemed almost leisurely at 2 days a week, this class feels like we're on speed. Several people have dropped out and I'm not surprised...we're on warp speed and I can barely keep up with grading the papers. I managed today to get down to the Forks and saw my rug, carefully wrapped around a concrete pylon near the river. The colors matched and it looked like camouflage. The tag with any information had disappeared..so it did fade right into the scenery. Oh well..next time I'll have to do something a bit brighter. I went off to get myself frozen yogurt with fruit mixed into it...a great treat during my very quick distraction from work. On my way to the car, the sun was shining. I ate my frogurt and saw an African man about my age with his 3 year old kid walk by, hand in hand. "Look," the man said to his little boy, "Did you see that beautiful lady!?" I stopped and smiled and said what I'd been thinking-- "Look at that cute kid!" Everybody was happy. It was a perfect moment. The last few days were a blur, but the professor has been carefully documenting things with photos so I could tell you about everything. First, he wanted me to mention that he brought two of our house guests to the Forks in downtown Winnipeg to see the Craft on the Loose exhibit put on by the Manitoba Craft Museum & Library. Here is a smiling house guest, pointing out my name on the exhibit's sign! The funny part is that although they all looked, they could not find my piece of weaving at this outdoor exhibit. The show is on at the Forks until the 20th of August, so if you happe n to be down there and find my rug, drop me a line! The sheep show and 1st annual fibre festival at Neepawa was fun. It was also cold, wet, and windy. The professor and I got up at 6 am so we could be driving to Neepawa by 7:15. When we got there around 9:30 am, the professor caught photos of a lot of the action. Here are a few of the photos he's sent along for our enjoyment. There were sheep shearing demonstrations off and on all day. This shearer also managed to come to my class on "Marketing Your Wool." He has both Rambouillet and Cheviot sheep on his farm and we had a good talk while walking from one building to the next in the rain. I'm looking forward to talking with him again sometime when we are both a bit drier! The festival was mainly organized by the 4H group, called the Prairie Shepherds of Manitoba. The sheep ring was very busy, with lots of kids showing and competing with their "meat" sheep. The sheep in the competition seemed to be mainly Suffolks. Of course, these sheep have wool too and it can be useful for the handspinner, but the emphasis here veered away from wool. That is something I can perhaps go into in another post, as I definitely have more photos from the competition! Meanwhile, there were stockdog trials going on outdoors in the mud and rain. The pro fessor took up a position along the fence and shot lots of photos of dogs and sheep in motion. Here's an example of the conditions. The dogs included border collies, and Australian cattle dogs, among others. This show was particularly interesting because the dogs were allowed mostly free reign when they weren't running the sheep and behaved themselves admirably. For the most part, these are working dogs and they didn't appear to bother any sheep or people when off-leash. It was a joy to see this. This one is hands-down my favorite. Note the border collie (named Juno) at the front of the photo. This dog was a real lover and attended my whole class! The fleeces I saw in the competition and the events were really very impressive. Considering the cold, wet, and windy conditions, it even seemed reasonably well attended. I'll write more about the spinning circle in my next post, but it was definitely a worthwhile day. The professor and I had to return home in the afternoon to our house guests, so we missed the lamb barbeque and other events. Also, my feet (in their handknit wool socks) were soaked clear through and I was ready for a hot shower and warm jammies at home. Even so, it was well worth the trip. Teaching 4 days a week and having two sets of houseguests (it was three sets last weekend--we even used the living room sofa bed) has kept me from posting...but I miss you! I'm off to Neepawa on Saturday to go to their sheep show. Hopefully I squeeze in another post-with photos-before or after I leave. In the meanwhile, thank you for all those nice comments about my newly painted porch steps. The professor did a great job and I love the color every time I step out. It makes my porch feel all new and fashionable! More to come soon, I hope. We had an amazing August Long Weekend here. That's a special Civic Holiday that gave us Monday off. Canadians have such a civilized number of holidays. I'm really enjoying that part of living here! We did a lot..shopping, sightseeing, and lots of work on the home front. Here are some photos of some of the excitement. I got my warp ends retied and the loom is up and running again. I'm working on this zigzag pattern but as I only have a spare moment here and there, it isn't going too quickly. We went out to Folklorama pavilions on both Sunday and Monday nights. Since our Resident Student is visiting from the USA, we thought it would be a good "family" excursion and so far, we've "travelled" to Serbia and French Canadian pavilions. The latter was not all that far from home, but since I've only exposed her to a small amount of Franco-Manitobaine culture, it seemed important. Meanwhile, the Professor was busy, too. The weekend was both sunny and rainy. The Professor managed to dodge thunder and rain showers outdoors and did some yardwork. He also created this marvelous tranformation. 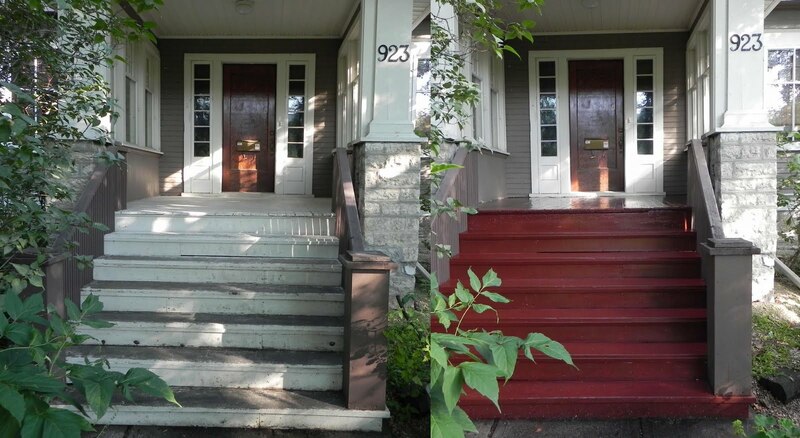 See our old porch steps (dirty grayish white peeling paint and no paint) and check out our new front porch look! The dark red matches the contrasting paint on our house and it also shows a lot less dirt. I love how it looks, I love that he did all the hard work and best yet, I love how it won't show as much dirt. It's not fun mopping the front porch. I've started teaching my second session of "Writing for Graduate Students." This course is 4 days a week throughout August, so it's all grad student writing, all the time around here...I'm a busy bee. "How are Harry and Sally doing?" Harry the dog is doing just fine. He's a mere shadow of his former self! He has been dieting this summer as he gained a bit of weight last winter. He also has been "blowing coat" (losing his heavy fur coat) and I've been grooming him nearly every day. Soon I'll have enough Harry fur to spin up some yarn for warm mitts for winter--my very own fiber-producing pet! Here he is, featured in a stunning pose on the living room rug underneath the coffee table. Sally dog is also doing well. She does not enjoy the summer thunderstorms. She finds it comforting to hide during the scary lightning parts. Here she is, with her sheep toy on her dog bed, in the Professor's study. Last, but not least, I got a very nice email from the International Blogging Recognition Council saying that my blog was honored with a "Recognized Blog." Apparently someone who enjoys my blog referred me to them. Whoever you are, thanks very much for this honor! Now I know. The first annual fibre festival (Canadians spell this "fibre") in Neepawa is about 2.5 hours away from Winnipeg. It's being sponsored by the 4H Club and the Manitoba Sheep Association. There will be sheep dog trials, classes, and sheep competitions. There's a wool judging on Saturday and a fleece auction on Sunday. This will be the place to get Manitoba raw wool for spinning and felting, direct from the producers! Plus, it raises money for 4H, which is a great program in both the U.S. and Canada. Here's the information below--I'm teaching a class for shepherds on how to market their wool and I'll be at the spinning circle. There will also be a felting class, too. If you're free August 13-15, I'm sure there will be a whole lot of sheep and sheep producers looking forward to meeting you in Neepawa!